You guys like that Jeremy Signor cat, right? 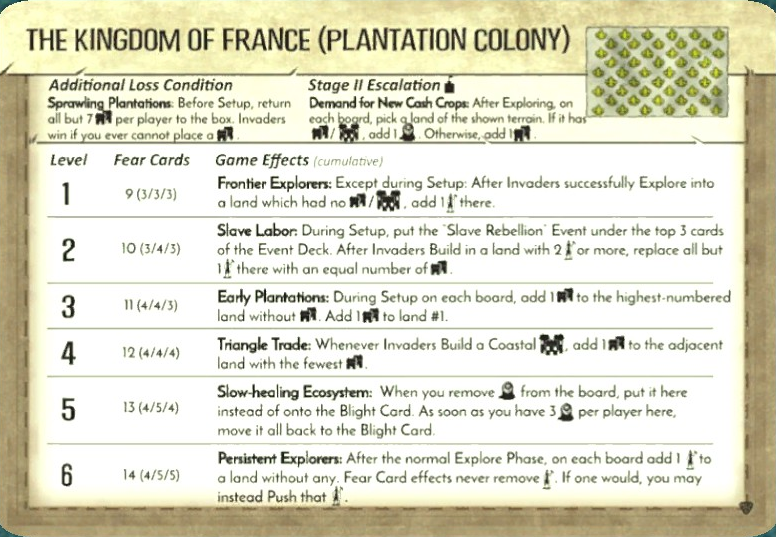 Well, here's an article discussing the theme of colonialism in board games and exactly what needs to happen with it. Spirit Island gets mentioned in the article, and in fairly favorable tones (which isn't hard when your competition is stuff like Puerto Rico), but it doesn't get off scot-free. 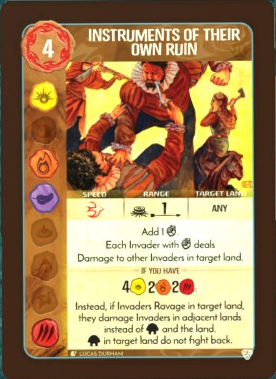 The two major complaints are that 1. the threat the Invaders deal in is largely abstracted, which makes the conflict feel a bit onesided when all they get is "Ravage" and you can literally sink an entire board on them if you want, and 2. the Dahan are incredibly secondary to the goal of preserving the island, which would lead many players to treat them as expendable tools. I think both of these are pretty sound points and have no interest in refuting them generally. Instead, this is all a leadup to talking about why people play as Thunderspeaker, one of the most popular spirits in the game. Yeah, Thunderspeaker has incredible offensive power comparable to Lightning's Swift Strike on a good day, but the real reason people play as them is because of how linked they are to the Dahan. 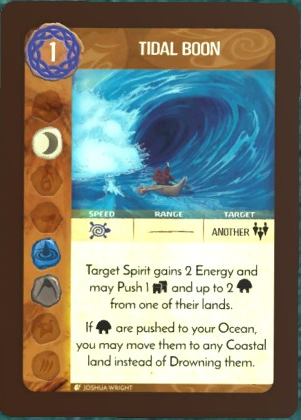 Many spirits can get some good synergy going with them, and a handful, such as Ocean's Hungry Grasp, don't really care too much if they live or die. Thunderspeaker, however, is so closely linked with the wellbeing of the Dahan that their Presence follows many of the same rules as they do, including being destroyed when they die to Ravages. Thunderspeaker, simply put, is mortal in a way the other spirits aren't, and if a spirit dies, unlikely as that can be for most games, you lose the game outright. And people don't play as Thunderspeaker DESPITE that limitation. I've introduced a person to the game primarily because they WANTED to worry about the Dahan and do everything they could to keep them alive and winning. Playing as Thunderspeaker means watching out for every one of those little huts like you know the individuals within on a first-name basis. It helps that Thunderspeaker definitely has the firepower to back up their limitation. (Ask me about knights in Fire Emblem sometime.) 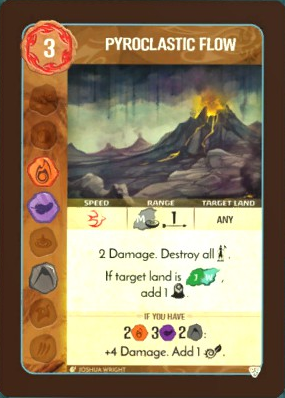 Damage multipliers in Spirit Island are incredibly rare, and Thunderspeaker has the rare honor of being in possession of one of these from the start. That said, actually using this power effectively requires a lot of careful planning and timing. Lead the Furious Assault is already capable of mondo property damage, if perhaps not as effectively against Cities. 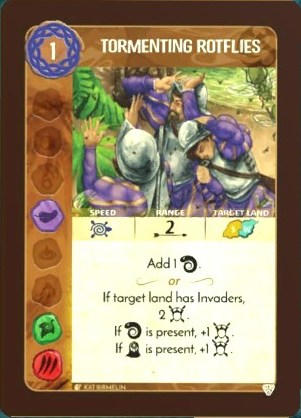 And if the Invaders are about to Ravage, it's generally more efficient to just pop a Defend on your target unless you have 3 Presence in that land (and if you have 3 Presence and Dahan in a land that's about to be Ravaged I sure as hell hope you have a Defend up anyway). 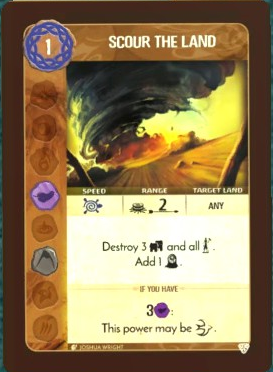 But when it all comes together, this power can just solve lands that any other spirit would've written off long ago (or would have to force a Blight cascade to nuke out). Naturally, you start with a Defend effect, and not necessarily a bad one either. The Dahan-only restriction isn't even that big of a deal since you have lots of Dahan movement and incentivization to protect lands with Dahan in them. 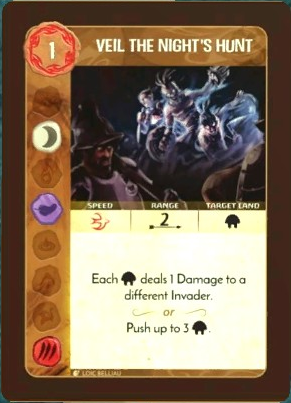 The simultaneous damage effect is weird, because while it's very good, it also is only good when you're going to take casualties from the Invaders' Ravage that would weaken your counterattack, which means Thunderspeaker's going to lose at least one Presence any time this effect gets activated. And Defend 3 is decent, but you're going to want a bigger number in the future. Like Lightning's Swift Strike, Thunderspeaker only has one card that can take down Explorers. Unlike Lightning, Thunderspeaker's card is actually good. 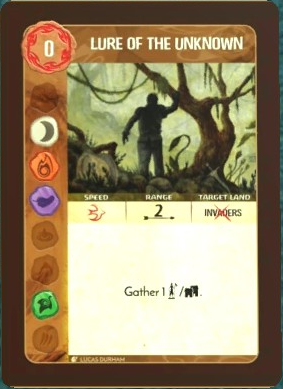 The fast movement of Dahan let you get your Presence into position, the scaling based on Dahan in the area means you can use this for cleanup if you've been pushing lots of Explorers, and most importantly: it doesn't cost 3 NRG you dang madman. Thunderspeaker's Dahan management is their most iconic gameplay theme, but did you know you have to manage and juggle a lot of different elements, too? These elements all have different priorities, too. 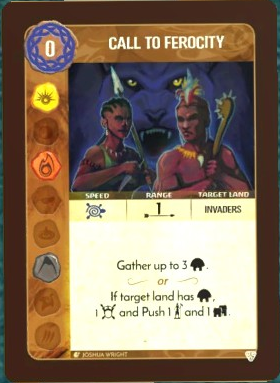 Sun is obviously key, as is Air, but you also need a bit of Animal (so you can activate Gather the Warriors at all) and Fire (while your track lets you get the first level of Lead the Furious Assault with only a single Sun card after a point, the second level needs more investment). The annoying part is that while Animal is a pretty good element, only requiring a single bit of it makes it annoyingly difficult to spec for. When do you have enough? How much do you prioritize it over your other elements when deciding? It's a delicate balancing act, especially when only half your starting cards provide it at all. I guess what I'm getting at is your first card play in every game should be Sudden Ambush, and that Voice of Thunder, while being pretty good for 0 NRG, isn't actually that useful for Thunderspeaker most of the time. Reclaiming has a very important effect on the player's tempo, and it's the chief limitation in high-play development for your spirit. NRG, at least, you can build up over time, but reclaiming is a necessary thing you have to do in order to keep functioning at full capacity. This leads some spirits focused in that vein, like Lightning's Swift Strike, to hold back on their max card plays if they can't contribute sufficiently with them. Gift of Constancy is a really nice option for these spirits for obvious reasons: it costs 0, and you can get a reclaim for yourself as well as an NRG boost and a reclaim for your friend. But it's even better for high-NRG spirits who have picked up a good major power (or have good starting powers) and are perfectly happy just bouncing it back into their hand as often as they can, while also spiking the NRG and reclaim of the spirits who need it most. Plus, those elements just scream Big and Slow. Nobody really WANTS to take Rain of Blood. All of its restrictions are put on an underwhelming effect, and the elements are all askew from what basically anybody wants except MAYBE Bringer of Dreams and Nightmares. But maybe that'll change with Jagged Earth. I know there's at least one spirit out there that likes Air and Animal together. Fast damage is nice, and fast Dahan movement is also nice, but the damage effect here is a little weak. 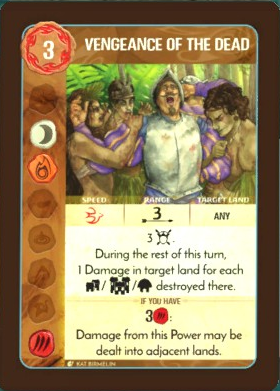 Each Dahan is forced to spread their damage around, weakening the effect significantly. Even so, this is a definite dream card for Bringer of Dreams and Nightmares. 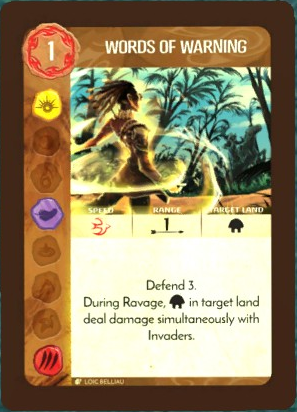 Not just from the elements, but because 1 damage to each Invader in a land (up to a point) can be capitalized on pretty handily, either by defending those selfsame Dahan during a Ravage, or using your own damage effects later on for a huge spike in Fear. Come on, guys. This is just a major power that's being lazy. You can't fool me. Hello, dream card for A Spread of Rampant Green! The basic effect for this is already really good, especially for spirits who have a hard time extending their range like Keeper of the Forbidden Wilds. 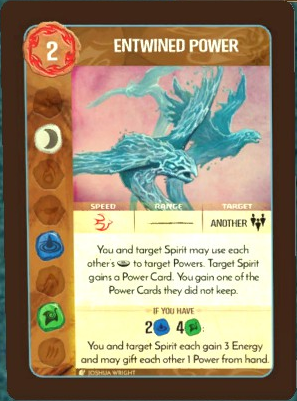 But it's also nice for spirits who want to get lots of power cards, like Lightning's Swift Strike. The threshold effect here is nice for the NRG boost for sure, but the card-trading effect can lead to some WEIRD scenarios. It also lessens the chances of some other player finding your dream card and getting rid of it, and gives you another avenue for getting cards that don't gel with your style at all out of your hand (aside from Major powers, which aren't for everyone and are subject to the same problem of luck of the draw). The two biggest elements for Fear generation in the game are Moon and Air, with Moon being a bigger contender. There are other elements that can have the effect, like Fire, but usually it's those two. 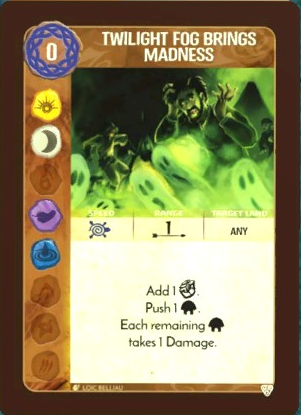 Earth is not usually the element in question, so what makes it so central to this heavily Fear-themed card? I think it's because the primary effect here isn't the Fear, it's the immobilization. 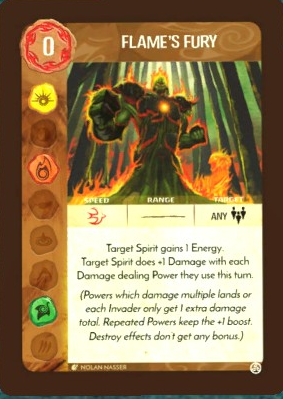 Vital Strength of the Earth has the same effect on one of their Earth-bearing starting cards. The method you obtain that immobilization by is fear, but it's about keeping things the same either way. Also please appreciate Bringer just kinda hanging out in the window staring in. The trick here is that while these are elements Ocean can invest in, they're not what it usually tries for. Air is generally its lowest priority, with Water and Earth being much more important for their raw destructive power and NRG income. 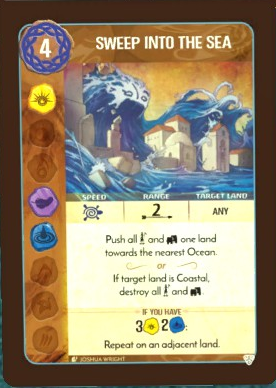 Still, I'll happily take this card as Ocean even if I haven't been going for Air, nothing a few more power card draws can't fix! Bringer can't deal damage (even if it's the Dahan thematically doing it -- relevant FAQ). This is a fast card. If Bringer could play this slow, it could be amazing to "clean up" after a Ravage, but as is, it won't do anything. That's not what Kalir's saying, I think. Whether nightmare damage or not, it still accumulates over the turn, so a later power that does nightmare damage can let you frighten the softened-up towns and cities. Also, a nightmare damage to an explorer pushes it, which does protect against a Ravage. Right. 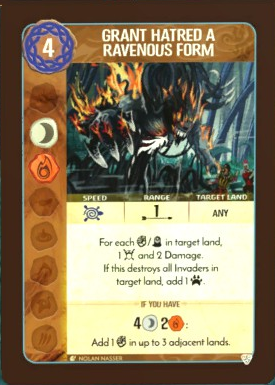 So you could target, say, a land with two Explorers, a City, and three Dahan, use Veil the Night's Hunt to chase out the small fry, and then follow up with Predatory Nightmares for the City's "destruction". Unless that's not how it works, in which case it's still a good card for Bringer, just not as good as it could be. Also not true; see this entry. Bringer isn't dealing "nightmare damage." No damage is dealt at all. That's super weird given that the rules are extremely adamant that order never matters during power resolution. I'm not sure what you mean. The order in which you play powers has always mattered, and resolution within the power is as normal even with this ruling. 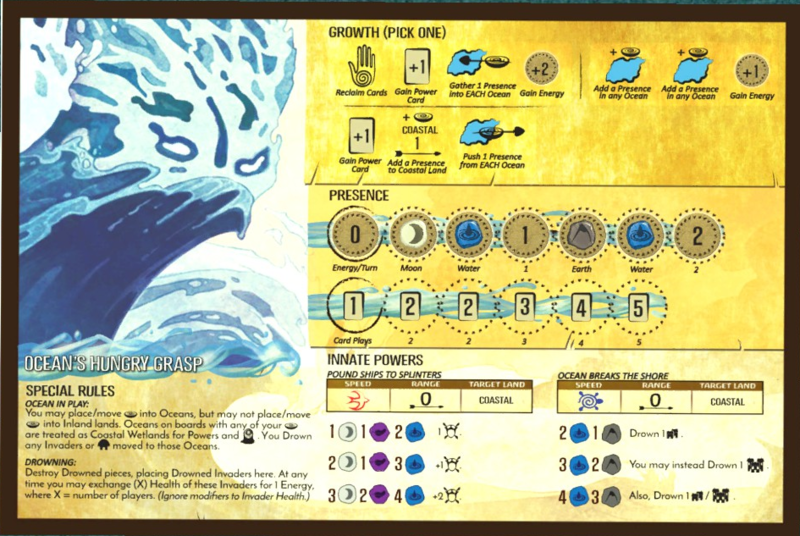 Ocean's Hungry Grasp is the first of our High complexity spirits, and a personal favorite for being another excellent mesh of gameplay and theme, as well as one that manages to outweigh their significant drawback (COASTS ONLY NO ITEMS FINAL etc.) with tremendous power and potential. In a lot of cases, Push/Gather effects are an excellent way to neuter the threat that the Invaders pose, with the exception of Cities since those tend to require a more concentrated attack to bring down. 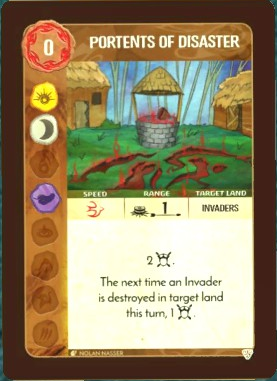 However, you run the risk of piling up too many guys in one land when the Invaders start acting in that land. Ocean's Hungry Grasp provides a convenient way out by letting you just chuck them in the ocean WHERE THEY BELONG. This is especially strong for spirits who trade damage for shoves, like Bringer of Dreams and Nightmares. Like A Spread of Rampant Green, Ocean's Hungry Grasp has two potential routes it can take with further powers: intense Fear generation with Moon and Air, or structure smashing with Earth. Unlike Green, the element distribution of your starting cards isn't quite as regular, and the weight of these effects favors the stronger power in my opinion, so oftentimes I just disregard getting Air on cards outright. 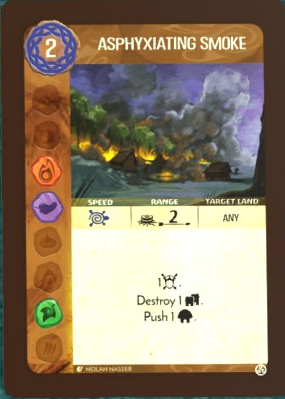 It certainly helps that Call of the Deeps is a VERY good card, and that you only need one Air to hit the second level of Pound Ships To Splinters Eat Boats. It's also your only initial method of hitting Inland enemies, however indirectly. It's important to note that every single one of Ocean's powers can only target Coastal lands. Even if you extend your Presence with Growth, that only lets your 0 range powers hit Coastal lands rather than just the Ocean. 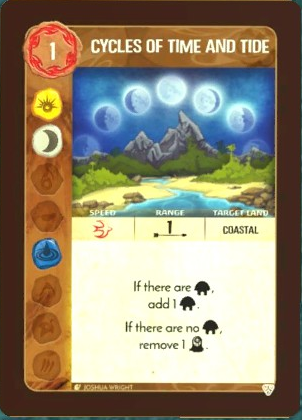 This means that while for most spirits, a Defend 4 with 2 fear for only 1 NRG is a really good choice, it's mostly just kinda necessary for Ocean. It does mean you can buy a bit of a reprieve if a coast is getting hit too hard provided there are some Dahan around to take the heat. Ocean's Hungry Grasp doesn't really play nice with Dahan, though. 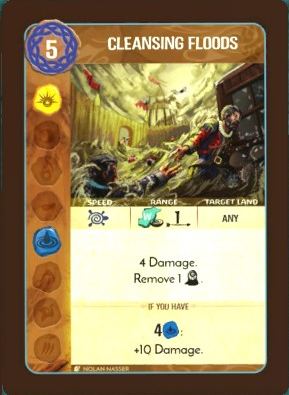 This is a very good card, specifically because it lets you outright drown enemies without using your innate, unlike every other card you're going to get from here on out. 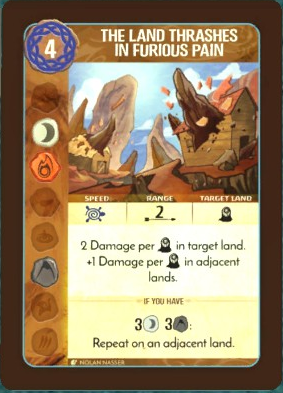 But if you want to use it optimally, you have to avoid targeting lands with Dahan, which means extending your Presence to a bunch of different potential target lands. Which you want to do anyway as Ocean so you can put your Ocean Breaks the Shore innate to use. I tend to run tides-in a lot as Ocean. This is another one that's really good for helping teammates shove things into the ocean while also giving them a little bit of NRG to work with. It also doesn't have to be used on coastal lands either, although it's better if you do. 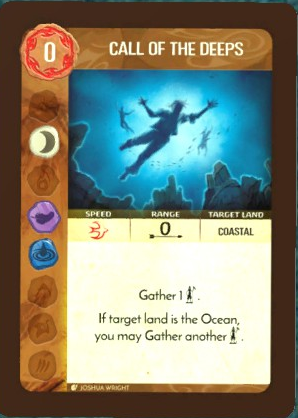 The Dahan-teleport is weird, and I can never really find a good way to use it solely because it's usually in a game with Ocean's Hungry Grasp, and therefore the coasts usually don't want that many Dahan around. It combos with Grasping Tide a bit I guess maybe? But it combos with Ocean Breaks the Shore even more. This is another good card that I don't usually like to pick up. Part of it is that it only helps a specific subset of spirits, those who have a hard time getting their Presence extended and so need the range boost, which on its own is fine. But then there's the fact that you don't really get anything yourself for playing this card except helping someone else (which could be you) do shenanigans. Which, again, is fine on its own. The two of those together, plus the fact that this card becomes less useful as a game progresses, just make the entire set unappealing, not to mention the fact that some players might consider it a card that they're just going to have access to. I like helping other people, but I don't like that help being taken for granted. Of course, that's less of an issue if you play with cool people who are friends. A very nice set of elements, a fast effect, a threshold that's not necessarily impossible and if you don't hit it that's okay. The only problem is the range. And that's fine with me, really. 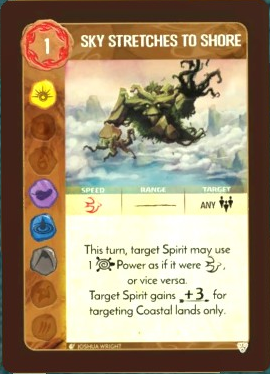 Lots of spirits want this card, but I think Lightning's Swift Strike and Serpent Slumbering Beneath the Island are chief among them. 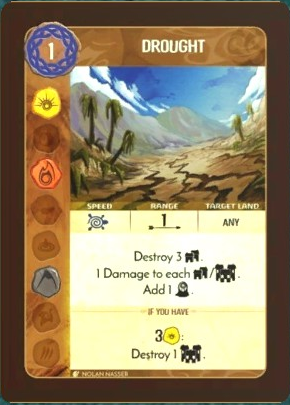 I really like the terrain-dependent cards, since they let themselves have more thematic creativity by their limitation. It also means that if you're a real card-counting sort of person, you can more readily categorize lands based on the potential options that you have available to tackle them. And, of course, you have spirits who have constraints on what lands they can mess with to make these options more or less attractive. But you're out of your damn mind if you think I'm ever going to play this for the measly Defend 1. 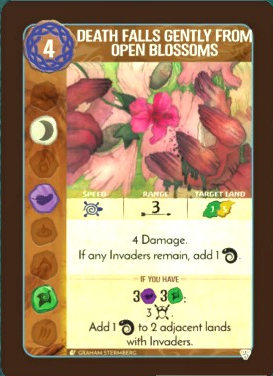 I don't know how a card can be so idyllic in theme and so scary in mechanics at the same time, but I like it. Just barely beaten in range by Mists of Oblivion (and even then only because that one doesn't require a Sacred Site) but that's okay because of the really good Defend effect. The threshold on this is nice too, but it's hard to hit for a lot of spirits at the moment. Bringer of Dreams and Nightmares can do it most easily, and they still get the replace effect since it's not a destroy. This is the only way in the base game for most spirits to return destroyed Presence to play. And it's a hell of a dynamic entry, too. This is another dream card for Heart of the Wildfire in several ways. 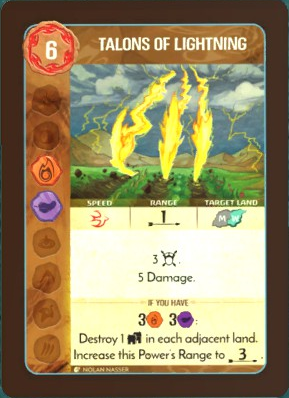 The elements are very good for The Burned Land Regrows, and it lets you more freely extend into lands controlled by other spirits, or use your more destructive powers in their lands. After all, you might destroy their Presence now, but that's cool because you can just re-establish a Sacred Site for them wherever you want and also kill everything in that land. At the complete other end of things, here's a dream card for River Surges in Sunlight. In fact, these two are probably about as dream card as it gets. One of the two most expensive powers in the base game, tied for Tsunami. 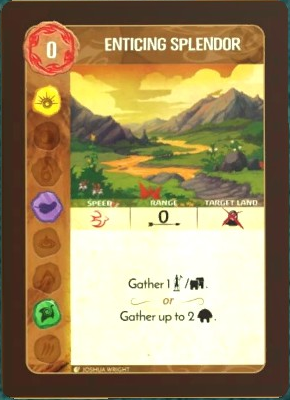 Note that both of them have very harsh targeting restrictions, but also note that they can do things to lands outside of their primary target. 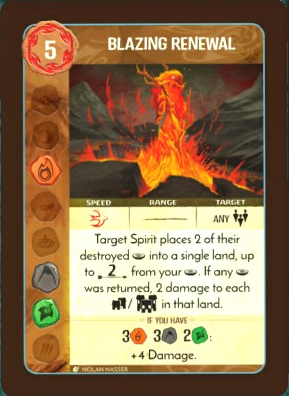 Multi-land effects are rare for a reason in Spirit Island. The biggest threat the Invaders have is the ability to target more lands than there are players, forcing them to prioritize and cooperate. As soon as you get any kind of effect that can target multiple lands, even a small effect like a Defend, all of that threat just goes right out the window and is never seen again. There's a reason these cards cost 6 NRG and have targeting restrictions. I wonder how much crossover there is between tabletop game enthusiasts and legal professionals. It's easy to make the mistake that I did earlier regarding how To Dream A Thousand Deaths works, but you can still see how a hopeful misinterpretation could change things up. 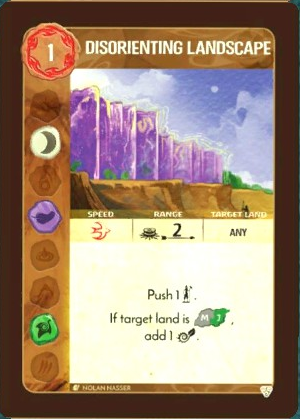 Thankfully, Spirit Island takes the right approach to a realization you've been accidentally cheating ingame (which I believe a few other game devs, like Level 99 Games, also adopt) and that is this: if you were accidentally cheating in your game, it's okay, just keep going as is and take the rules into account next time. Especially for co-op games like this. If you try to go back and undo all the changes your inaccuracy caused, you're just going to bog things down and make the game a headache for everyone. The funny thing is, this sort of thing happens even with games considered accessible entries into the hobby. People have made the remark that nobody enjoys Monopoly because nobody plays it right. I think they're wrong and Monopoly has always been bad, but details. I've seen someone claiming that you had to win Pandemic by wiping out every disease and THAT was a fun notion to dispel. At the end of the day, reading through long rulebooks isn't for everyone, and the quickest way to learn anything is to just do it and learn via experience. Which means that a lot of simple misunderstandings like that can propagate even in very simple games. But they're still just games, nothing's going to get damaged except some feelings, and as long as you can admit the way you always did things isn't how it's supposed to be done, it's all fizzy. Right, now that the after-school special is over, let's talk damage. Very few spirits spec towards damage in any reasonable capacity to start. A Spread of Rampant Green and River Surges in Sunlight both have multiple sources of damage, but they're very awkward in the case of the former, and tend to be apocalyptically useful in the latter's case one they've progressed enough. The weird thing is that due to the prevalence of Destroy effects, raw damage alone usually isn't going to do very much unless there's a lot of it, and that's especially true in Bringer of Dreams and Nightmares' case. This card could just be a push of 2 Explorers and Dahan for 2 NRG at slow speed. It could also get you 10 Fear. Cooperation is, as ever, key. 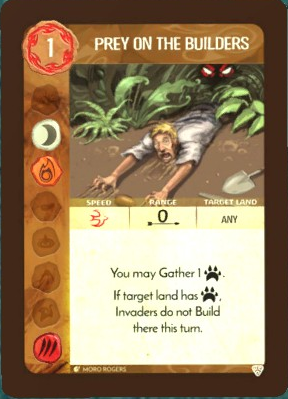 Most cards that generate Fear don't care about the land they target. Fear is Fear, no matter where it comes from. Dread Apparitions turns that around by letting you use Fear to fuel a Defend effect. On its own, again, it doesn't do much. But even out of the gate, Bringer can combo it with their Night Terrors innate to get a respectable number up, more than enough to handle virtually any early settlements. But later on, this isn't going to cut it, not when Night Terrors demands you to be in the very land that's about to be Ravaged and larger settlements start building up. Course, if you get some other fast Fear options, it can stay competitive for a lot longer. One subtler element of Bringer's design that I really like is that all of their powers work through people. 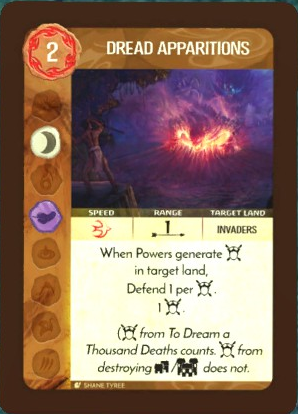 Sure, To Dream A Thousand Deaths prevents them from actually dealing damage, but every single one of their powers is either rooted in shenanigans for the Dahan, or scaring the Invaders. They have no healing, barely any spirit support, no restrictions on terrain... granted, it's hard to simulate other stuff without the Event deck, but I still like it. Shadows Flicker Like Flame had two other things it did besides Fear: helping the Dahan and killing Explorers. Bringer still works with the Dahan pretty easily, but its other wheelhouse, surprisingly, is Major powers. Out of everyone in the core set, they're one of the best in the game for getting and using Major powers despite their abysmal card play progression. Part of that is that they have amazing elements. 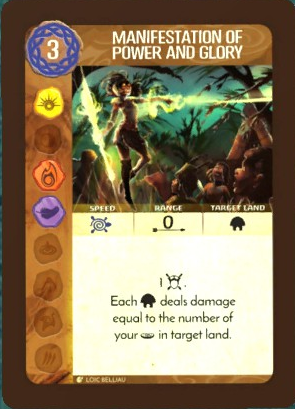 Being able to tune your elements to whatever Major power(s) you feel like throwing this turn is incredibly handy and gives them a lot of freedom in choosing newer ones. 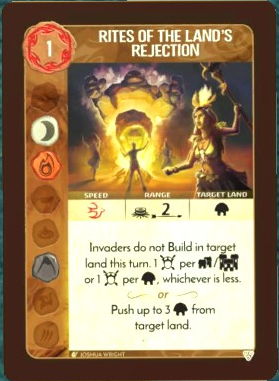 They also have two very nice Reclaim options in their Growth, which let them bounce a preferred Major card back into their hand to use over and over again. Only real problem is their NRG gain isn't super amazing. It's not bad, but both of their tracks start out above average and have a bit of a hard time ramping up, and the only Growth option that spikes NRG also puts some restrictions on where you can progress. Plus, quite a few of your starting powers have a bit of a cost to them. A pretty good effect for how little NRG it costs, but I rarely see this one taken. No love for the goofy gopher gang. By contrast, this card that only provides elements gets taken and played a lot. The value of individual elements varies from game to game. 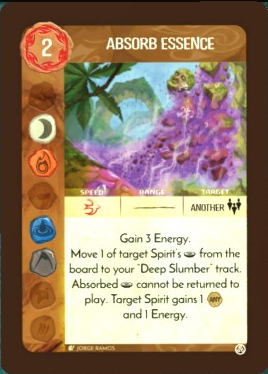 Obviously, each spirit wants to trip their innates as much as they can, but sometimes your power draws just don't support that, or you're running very low card plays, or just can't get new powers enough to justify splurging on a Major power that would require elemental investment. 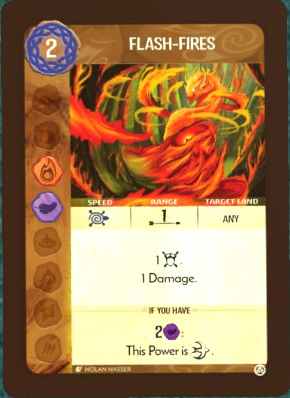 Additionally, Elemental Boon loses value if you don't share favored elements with any other spirits in play (for example, if you're playing Lightning's Swift Strike and trying to work with Sharp Fangs Behind the Leaves. At best, you can share, what, 1 Fire?) since you're effectively sacrificing a card play of yours for a better threshold on theirs. So do you attempt to defy the problem anyway and take Elemental Boon, or shrug, roll with it, and get Gnawing Rootbiters? 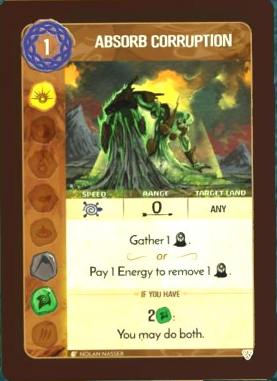 Can't help but notice that most of the dream cards for A Spread of Rampant Green grant new power cards to other spirits. A very powerful card desired by a wide range of spirits. 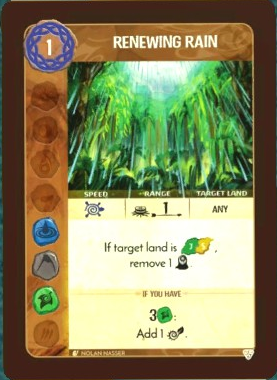 Only problem is that you have to target empty lands, which makes this one of the cards that gets less valuable as the game goes on (unless you're overtly winning and even Explorers are hard to come by). As far as the base game goes, cards that require an investment in Animal are generally disregarded. Every other element sees spirits that want a little bit of this or that. Animal is only needed by Thunderspeaker and Bringer of Dreams and Nightmares, and even then only in small doses. And since Vengeance of the Dead is a terrible pick for either of them, it virtually never sees play. 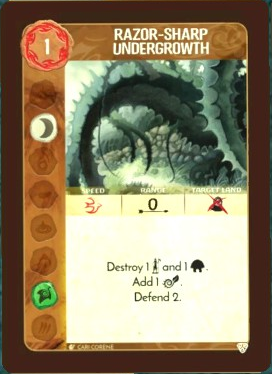 But then Branch and Claw rolls in, and this card becomes a dream card for the new friend, Sharp Fangs Behind the Leaves. Their heavy investment in Animal makes the highly-desirable threshold easy to get, they care significantly less about the Dahan than either of the above spirits, and it even helps with their slower, punchier innate, which they usually lack the Moon and Fire to pull off. And once Jagged Earth hits, Vengeance as a Burning Plague with this power? Now that's terrifying. In the meantime, most other spirits will simply make do with this if they want to capitalize on things dying off. Unlike Lure of the Unknown, this card gets significantly better as the game goes on (unless you're winning). 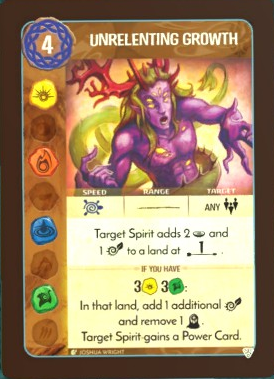 It's nice for spirits that have picked up other cards that cause Blight (particularly Heart of the Wildfire), leading to devastating combos that even the most dedicated Invader capitals can't take. Just don't forget to clean up after yourself. 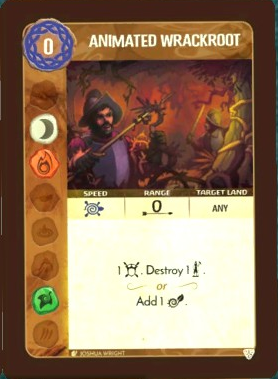 One lesson that's always a little pernicious for newer players is the concept of land targeting. Ordinarily, if you use a power, that power just affects the land you point it at. This can make effects like Gather a little underappreciated, since it lets you yank stuff from just slightly out of the listed range of the power. Wrap In Wings Of Sunlight lets you basically ignore range for its effect, because the actual important part (the teleport and Defend) doesn't care where you aimed the power. All that counts for is which teleporter origin you can choose (and which land you can gather to if you have the threshold). 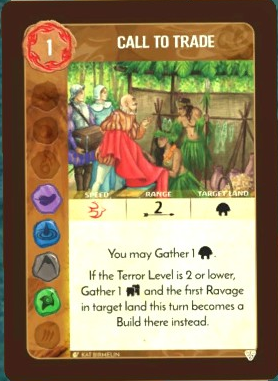 This is another really good Defend card, since you also get to dump a bunch of Dahan right at the land you're Defending and also you get to ignore range. "Oh man this is such a good card for Ocean's Hungry Grasp!" Well, yes, Indomitable Claim lets them disregard the restriction on their Presence placement, letting them target lands further in. 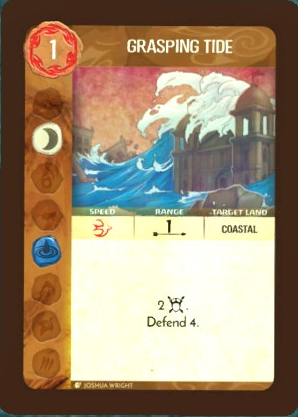 But even if you do, Ocean's starting powers still all target Coastal lands, so unless you've branched out into a bunch of other powers that would benefit from Indomitable Claim, it's a neat trick but ultimately not a very useful one. Got this for Christmas. Played a game with myself (Bringer of Dreams and Nightmares), my wife (River Surges in Sunlight) and a friend who knew how to play (Ocean's Hungry Grasp) as a tutorial game. I used Call on Midnight's Dreams early on, I think turn two, and picked up Indomitable Claim. My wife played a few energy generation and reclaim effects, letting me play it pretty much every turn once we got going a turn or two later. Then we just swept everything into the sea, pretty easy win. Now that we know the rules we'll need to start at higher than level 0, of course. Welcome to the expansion, boyos. One of the common complaints about the base game is that the island doesn't really feel that organic. 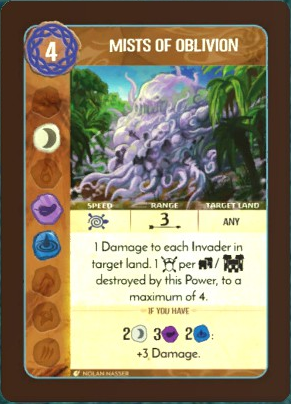 The Invader deck's design makes encounters feel predictable and formulaic, and the island has little to make it stand out. 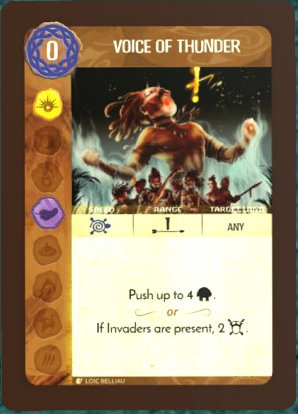 Branch and Claw fixed that with the addition of the Event deck to change things up each turn, which also added events to move the Dahan around and new token types to represent additional hazards to the Invaders. Keeper of the Forbidden Wilds, one of the two new spirits from this expansion, traffics in Wilds, a token type that prevents Explore actions in a given land. Wilds represent things that make travel difficult, like steep cliffs, dense foliage, or sand dunes with no landmarks, that sort of thing. Once you know the path, the threat is gone, and the Wilds are removed. And by that I mean you just pissed off one of the most dangerous spirits on the island. 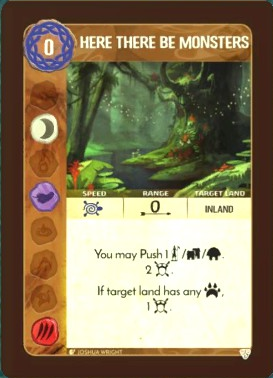 Keeper of the Forbidden Wilds is the Spirit Island equivalent of a cantankerous old man, sitting on the porch in his favorite rocking chair, holding a shotgun and daring anyone to mess with his lawn. Sure, he doesn't move around a lot and it's easy to do stuff away from his property, but he doesn't do warning shots. It's telling that the Dahan react to Keeper's Sacred Sites by immediately fleeing at top speed. Not even spirits like Ocean's Hungry Grasp command that level of fear, because they can always be appeased if you really need to get into their territory. 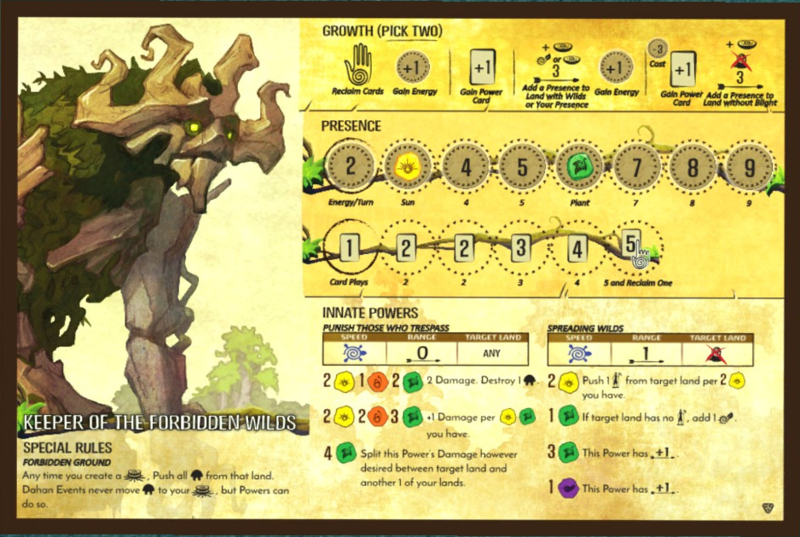 Mechanically, Keeper of the Forbidden Wilds fits much the same niche as Vital Strength of the Earth, and even shares the elements of Sun and Plant as a focus (although Keeper doesn't touch Earth and has a much higher focus on Sun and Plant). Flavorwise, of course, they're very different, as the Dahan and Vital Strength of the Earth work together much more effectively. As far as mechanics go, I'd just say that Keeper is flat better than Strength. There's a few reasons for that, among them the ability to double place Presence, the constant placement of Wilds that let you keep a cleared land clean, and the multiple ways to do lots of damage. Of course, Keeper has a restriction or two on their presence placement, but that's hardly an obstacle when you also have multiple ways to play Wilds, and to turn them into damage if Invaders still get into those lands somehow. Keeper also has some pretty nice support options on hand to start, too. 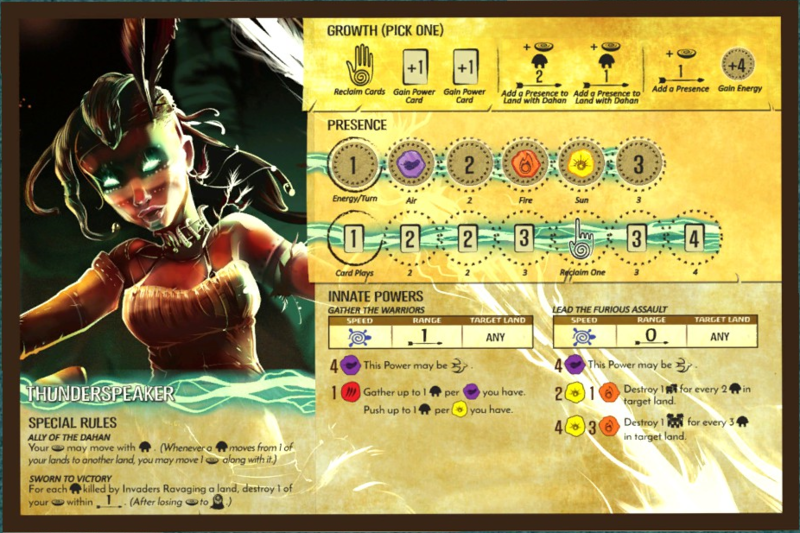 This one in particular is great for spirits that have few ways to get power cards and a high demand for playing them, but you already knew that. 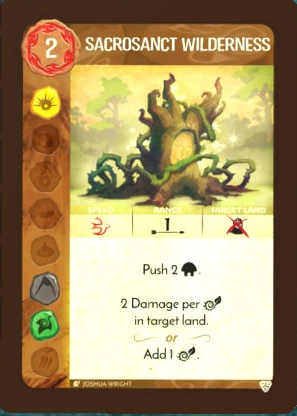 It's telling that Keeper is considered such a powerful spirit that Regrow From Roots is one of their weaker starting cards. 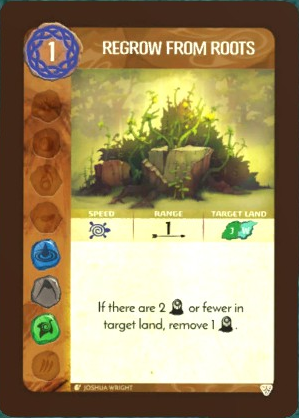 Sure, it stops being useful when cascades pile up, and it can only target certain land types, but Keeper starts with a Blight heal, and most of the time they don't even care to use it. Their other options are just that good, and this card doesn't have the Sun they desperately need. Also: despite favoring a high NRG low plays style, Keeper only has the one 3 NRG card in their starting hand. It's definitely worth it, but still, they aren't taxed as often with their regular card plays as Vital Strength of the Earth. The actual weaknesses of Keeper are generally considered to be its presence placement. 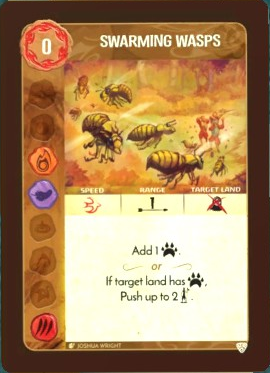 Keeper has serious issues with range, between the low range of its existing powers and the need for either Wilds or NRG to place Presence at any real distance. 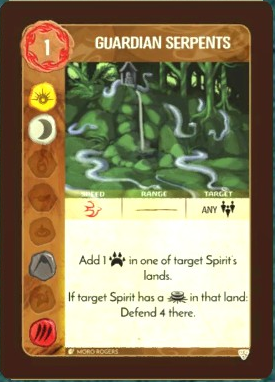 Besides that, as you can see, it's also an incredibly unsafe spirit for the Dahan, but that's rarely a problem when your Sacred Sites automatically push them to safety, and you're going to get a lot of Sacred Sites by design. Somehow I don't feel like that's enough of a weakness for them. 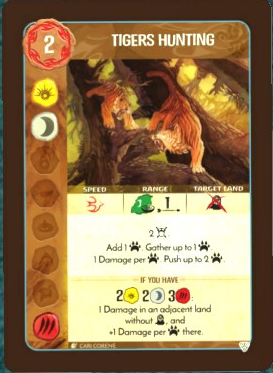 Branch and Claw introduces a total of four token types. 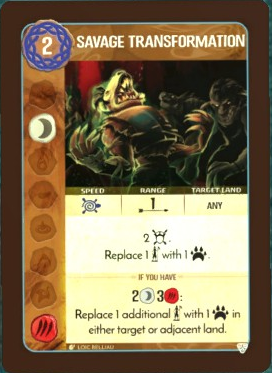 Beasts, seen here, don't have any innate effect like the rest do, but make up for it by being weighted, through the event deck, towards acting and appearing more often than other token types. Their usual stuff is just Fear generation here and there, with some Explorer munching and occasional costly damage. 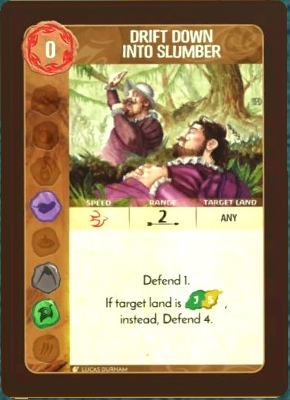 Unless you either know the next card in the Event deck is going to be one that packs a kick for Beasts, or are playing with a lot of Beast-synergy powers (perhaps because you're Sharp Fangs Behind the Leaves) then stuff like Teeming Rivers isn't that great. Not really a bad card, but not going to do as much for you as a card with similar elements and less of a beast focus. Like, say, Call to Tend. Next up is Strife. Like Wilds, it blocks one instance of an Invader action, namely Ravage. Unlike Wilds, it's on a per-Invader basis, and has a lot more synergy with certain Fear cards. Usually, operating procedure when adding Strife is to find the biggest piece in the target land and slap one on, and then to treat it like a relatively reliable Defend that you don't need to spend a future power on. Which means that for Twilight Fog Brings Madness, the cost isn't measured in NRG, but in weakening the Dahan in the area so they can't reliably follow up on the upcoming Ravage. 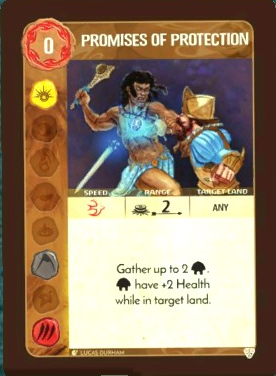 That's mostly in the Push effect, despite appearances; there are very few cards that instruct you to damage the Dahan, and most effects that do would focus on killing as many as possible before the Slow powers phase, so the splash damage rarely, if ever, secures any kills. Unless the Event deck has lowered their max health. Then you should worry. Finally, you have Disease. Like Wilds and Strife, Disease blocks one shot of Build in the target land and is then spent. 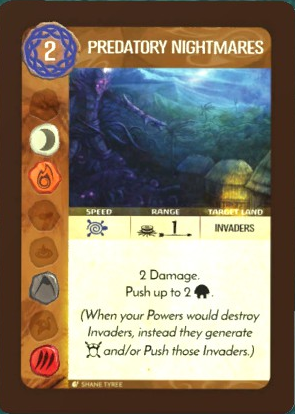 It's a very powerful token, since Wilds does nothing of note if Invaders already exist in a land, and Strife is a per-Invader token. 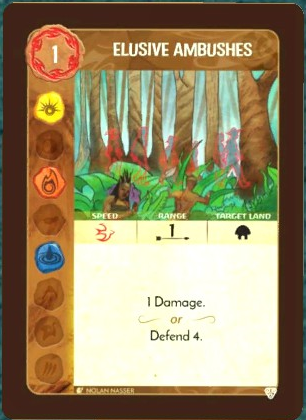 However, most instances of Disease in the Event deck also deal out damage to the Dahan, which makes them unsafe to put into lands where the Dahan are going to live for a while. 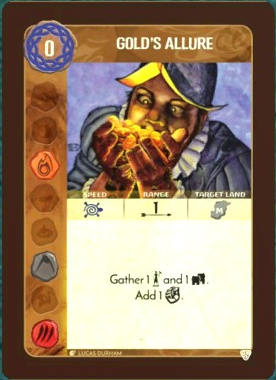 This means that Tormenting Rotflies, while good at putting out Disease due to its longer range, is frequently more valuable for generating Fear using already-placed Disease tokens. You CAN stack multiple Diseases in a single land, but that's usually fairly wasteful and can be hazardous. This doesn't really feel like an expansion card to me. It just feels like another version of Call to Bloodshed, there to keep the new cards from the expansion from diluting everything with new token shenanigans. It's a good card, though. Also a really good card. Wilds placement is incredibly powerful, particularly early on, but it loses potential if Invaders are able to get in regardless of the Wilds. Throwing an Explorer push on top of things can go a long way towards keeping a given land safe. The big problem is that it's much harder to predict where Invaders are going to Explore than the other actions. You can hedge around what remains in the Invader deck, like with A Year of Perfect Stillness, but it's always going to be a bit of guesswork. And Disorienting Landscape has a terrain restriction, too, so sometimes you can't even hedge safely because all that remains for the next turn is Sands or Wetlands. I guess even Ocean's Hungry Grasp has to try to replenish Dahan and heal Blight sometimes? Except the Blight heal, for them, is much more valuable considering how little they like the Dahan and how important coastal lands are to them. Maybe just let River Surges in Sunlight have this card instead. I see this card taken a lot, but I rarely see the threshold on it. I don't blame most players for that, either. 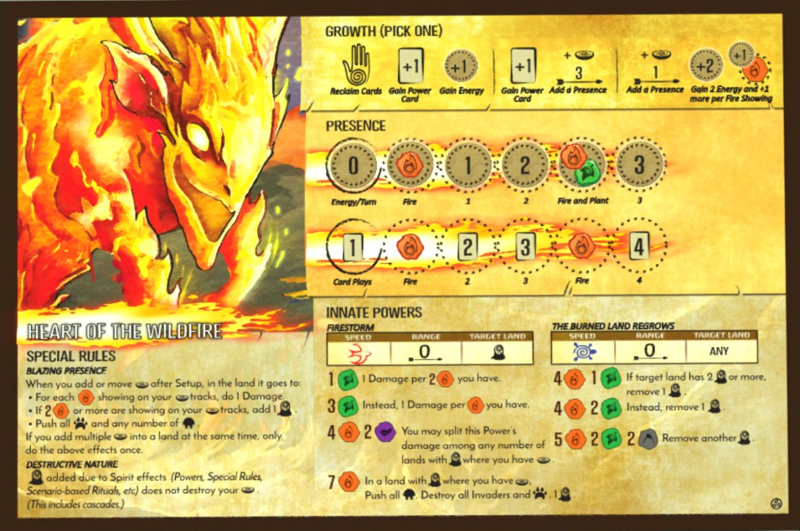 Getting an elemental Yahtzee is no small task, especially for spirits who demand heavy investment in their choice elements to maintain strong innates. 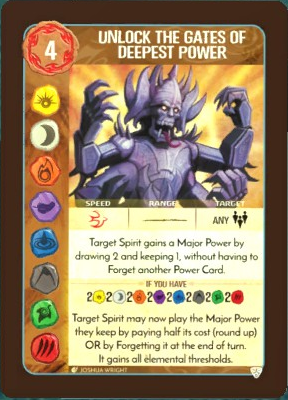 I think the two spirits most able to get this one to work are Vital Strength of the Earth (whose starting cards have highly varied elements and who doesn't really care too much about their innate) and Bringer of Dreams and Nightmares (who can achieve half of the elements on this with ease and use their other two card plays to tag the others). And Unlock the Gates of Deepest Power is still a good card regardless, because it can get people a free Major power. The lack of choice on it isn't a big deal since you take it without forgetting another power, so if your draw here is bad, just sacrifice it next turn for a different Major power more suited to your tastes. Well this one's perhaps one of the most bizarre cards in the entire game. The artwork, the effect, the elements, even the name. No part of this card is normal. I like it, I guess. 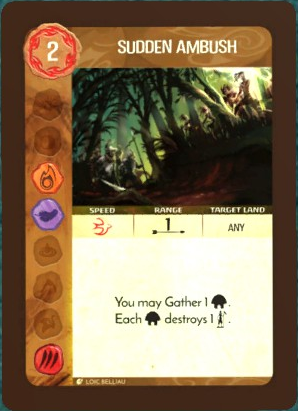 Despite the appearance of the token, Wilds can be represented in many potential ways. I doubt that Pyroclastic Flow would add greenery. Probably the opposite. So in this case, I'd say that this is you destroying pre-existing paths, natural or otherwise, and forcing the Invaders to find another way through the region. It's a good card, I like it. This might just be the easiest elemental threshold on a Major power to hit in the entire game. Last edited by Kalir; 12-29-2018 at 09:44 AM. In our games it's felt like the most common event interaction with plague is to turn it off - usually some variation on "no effect this turn but add more". 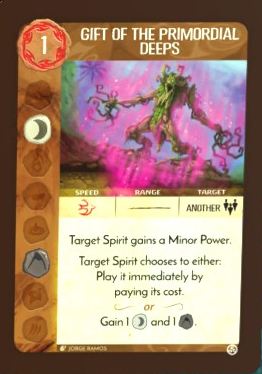 The other new spirit from Branch and Claw, Sharp Fangs Behind the Leaves, is generally more popular than Keeper of the Forbidden Wilds (murderkitties apparently have mass appeal) but they are, at least in my opinion, the weaker of the two. 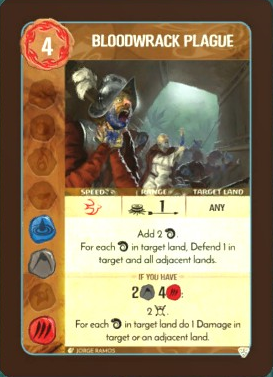 The dependence on Beast tokens isn't the main reason why, since they're easy enough to generate and the Event deck tends to get you more or make your existing ones better with a good deal of regularity. The inability to hit Blighted lands with Ranging Hunt, though? That's a big problem. Sharp Fangs Behind the Leaves struggles to perform in any land with Blight. But there's also the more pernicious weakness of being tied explicitly to Jungles, despite having Presence mobility like Thunderspeaker does. That one's going to trip up a lot of newbies, and lends this spirit to players who favor more long-term planning as to where they're going to establish themselves. All that said, though, Sharp Fangs Behind the Leaves is still a pretty good spirit. 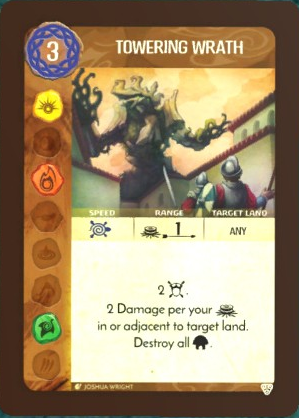 Fast damage nearly right out of the gate, with a threshold you shouldn't have any trouble hitting every turn after turn 1, plus two potential reclaims a turn? I can dig it. This one's annoying to reach because of the range. I often find people playing it for the Build block, only to realize they don't have any Presence anywhere the Invaders are slated to Build (possibly because they already killed all the Explorers there, which is a good problem to have). Don't underestimate that Gather effect, though. If you're having trouble affecting further lands, hitch a ride on a Beast! Yeah, this, right here. Can only be used from Jungles, can't target lands with Blight. The effect is good either way, but the targeting restrictions can get pretty heavy sometimes. 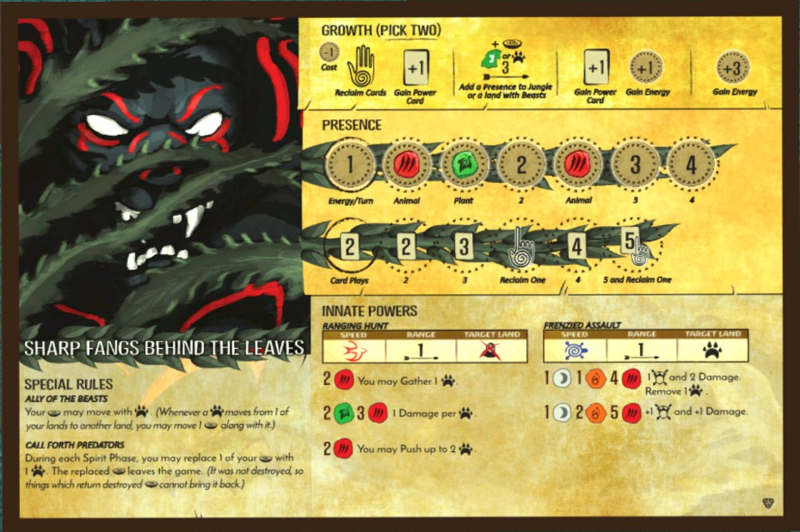 Until Sharp Fangs Behind the Leaves builds up a giant pile of Beast tokens, their Ranging Hunt will usually only be doing 1 damage per shot or so. Which is still good for picking off Explorers since it's fast, making them one of the best spirits in the game for tackling Explorers, and thus guaranteeing a niche. 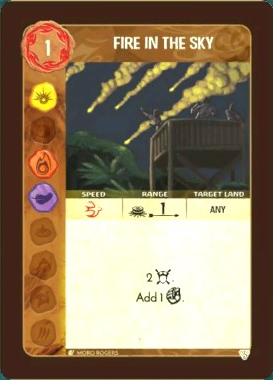 Too Near the Jungle, however, is not a very good card. It's a slow Explorer destroy for sure, but the elements are functional at best and the effect is underwhelming. It costs 0 and I'm still disappointed. This is your starting bunker buster until you get enough elements for Frenzied Assault, and it's pretty good (if a bit indiscriminate, since you have to target as many things as you can, which might scare Dahan away). It also is your only real way of putting the kibosh on Blighted lands. 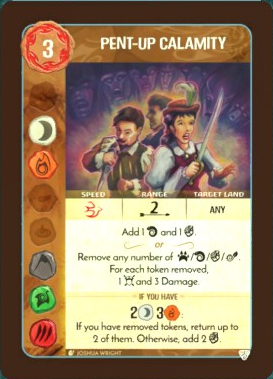 Speaking of Frenzied Assault, did you notice that Fangs only has two cards with Moon and one with Fire? You'll need to be prepared to get a more varied hand if you want to have that slower attack. Don't be scared of removing Beasts either, they come back quickly. My experience with Fangs was not positive. I did not have the event deck add a ton of beasts or do anything with them at all. And when you strike out like that, oh boy the rest of Fangs' kit does not do much. Like you say, Fangs' spread of elements on its innates push it to build a varied hand, but not that varied - it needs animal on basically everything it plays, and needs to play at least a plant per turn or Ranging Hunt does bupkis. And sure you can burn your presence for more beasts. But combined with your presence placement restrictions and awkward targeting is way less useful than it seems. I really think Fangs is the weakest of the spirits I've played. I'm guessing this is hedging against event deck highrolls, but when those highrolls don't appear, it takes a lot of effort to make up for them. 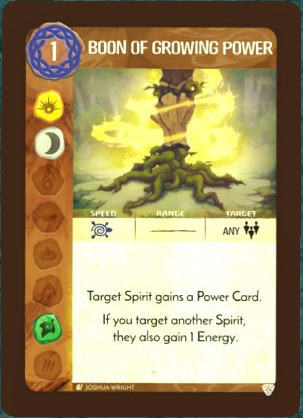 The good news is that Sharp Fangs Behind the Leaves is the only Spirit Island character who accidentally cameo'd in a totally unrelated fighting game. I like that the effect is basically "mandate wrong turns at Albuquerque" but I feel like most people will just take the Defend. This is so close to Call of the Dahan Ways in terms of flavor, but I dislike it significantly more because it keeps the Invaders doing what they do. Sure, it prevents the Ravage, but you're still very likely also turning out a City onto the board. Still, a City that's missing a Ravage is a City that is just gonna sit there and get dunked on at your leisure. So I can't really call this card bad, just not my style. It's weird that this one's named Call to Ferocity, yet has no actual damage involved. I guess the damage is implied in the Gather effect, and they just kinda intimidate the Invaders for the other one. 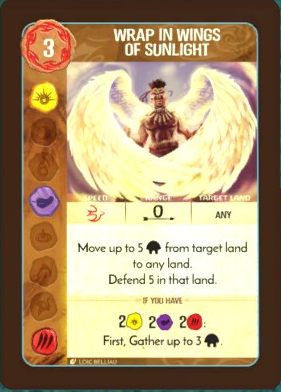 It goes without saying that if I didn't use Infinite Vitality despite it being a good card there's no way in hell I've ever used Promises of Protection, and I still don't intend to use it. This is a pretty nice pair of effects for a 0 cost slow card, to be honest. If you plan to target a land that's empty, you're basically coming out ahead no matter what you do. One of the few effects in the game that can move Blight. But how useful is that, especially as a Slow power? It can be a 2 NRG slow Blight heal at range 1, which isn't terrible, but is a bit chunky. So assume that you don't heal the Blight, but just Gather. 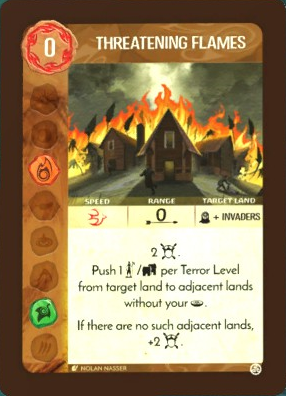 That's still good for relocating Blight for powers that care about targeting with it, or preventing a cascade when an already-Blighted land is unavoidably going to Ravage next turn. 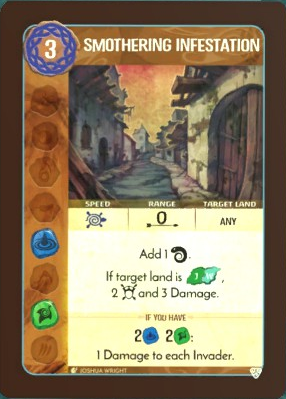 This card is really hard to use, not least because it require you to facetank a City-fueled Ravage. 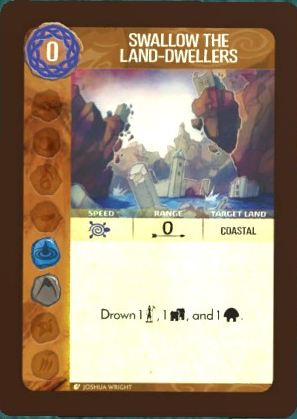 But you gotta respect a card that amounts to you standing right outside the Invaders homes and yelling "STOP TRYING TO HIT ME AND HIT ME"
I like that you can choose effects even if the land is Coastal, just so you can get that sweet sweet Ocean's Hungry Grasp synergy. But again, this is a card better suited to River Surges in Sunlight, and even without Ocean's Hungry Grasp in play it's still pretty good. But no, this isn't the most expensive card in the deck. It's only the second most expensive. Unless you count the, like... six or so Blight this could add with the threshold. Thank goodness those are optional. Y'know how Gift of Proliferation is one of the best cards in A Spread of Rampant Green's repertoire and also the base game? Here's a Major power version of it! But it's better for Keeper of the Forbidden Wilds. Wilds spam and some really nice elements! This is definitely one of those circumstances where Lightning's "make it fast" power is useful; it's also clearly good with anything that gives mountains of defense, but being able to generate more than 8 fear (6 base, +1 for the city, +1 for your presence) and then wipe out a city is Pretty Good. Hi! Let's take a brief detour from the expansion to look at a promo spirit. Heart of the Wildfire is, bar none, the best offensive spirit in the game. You can do incredible amounts of damage solely by placing your presence, but you also are going to add Blight just by doing so as well. You REALLY need to have a light touch with Heart of the Wildfire, but it's tricky, because your best firepower comes from adding Blight, and while you can heal it up, you're still amping up the placement real badly. Also: you REALLY want those tracks advanced, and it's not very feasible to leave it at only 1 Fire on your track. 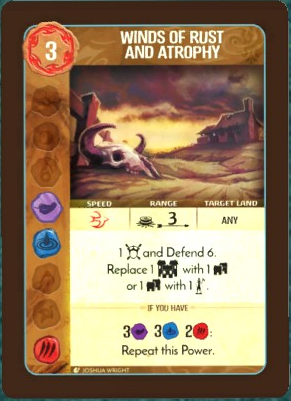 So you can't just play it cowardly like, and you don't really want to go without adding any Blight at all since that means you have no way to use Firestorm in the lands where it counts. But it is SO worth it for the easy fast damage. And also I guess you can use this card too. It's good for Fear generation, but let's be real: you are NEVER going to get that auxiliary effect. Now this card? This is WAY good. You might be like "but didn't you say that Damage is useless unless you have a ton of it at once?" Well, yeah, which usually means Flame's Fury isn't too handy unless you already have a ton of tiny damage sources. So at the very least, you can use it on yourself, and it's not the worst idea in the world. But if you want to see some real damage, put this on a repeating damage power. Like, oh say, Creepers Tear Into Mortars. How does 2 damage to structures, three times, sound to you? Meet the new Raging Storm, I guess. It's not super bad on account of the fact that you already have a ton of other damage to combo it with, and Air is an element you'll want to dip into a little, but it's still a weak card. So you've noticed the big elements here by now are Fire, Fire, and Plant, but with a little bit of Air. You also really want Earth, but you don't have any innately. 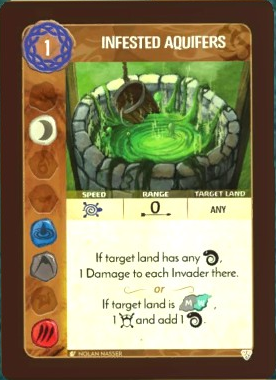 But splashing for that when you already need Fire and Plant is tricky, and while there are a healthy amount of those cards around, sometimes you'll have to prioritize. Don't neglect that Earth, though. And in the meantime, you have some pretty nice damage to work with, plus a decent destroy and Dahan push here! It's important to note that all of the tokens you can add are abstracted to a degree. Beasts need not be pack hunters! Also this is a really nice card for Lightning's Swift Strike to get into the Beast shenanigans. A good, but weird, support card that lets you pretend to be Lightning's Swift Strike or Ocean's Hungry Grasp. One element really worth noting is that this can actually slow down Fast powers. There aren't many instances where you'll really want to do this, but if you have, say, Steam Vents, but don't want to waste it on an Explorer when you're about to get a Town built on your doorstep, it can be nice. Drought for a new generation. Better at taking down Explorers, worse at taking down Cities. I think between the two, I prefer Scour the Land. Another card whose true cost is measured not in NRG, but in another resource. 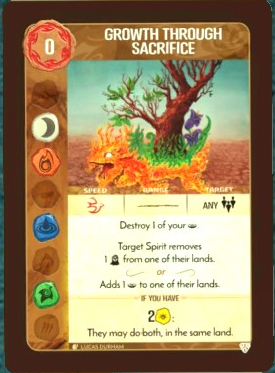 In this case, it's Presence, which combined with the elements makes this an easier choice for A Spread of Rampant Green, or any spirit in a game where Blazing Renewal is on the table. Only real gotcha here is that the Presence add is at range 0, so you'll only get Sacred Sites out of this, but that's not a big problem. See, Devouring Ants? THIS is how you incentivize a minor power that destroys Dahan. 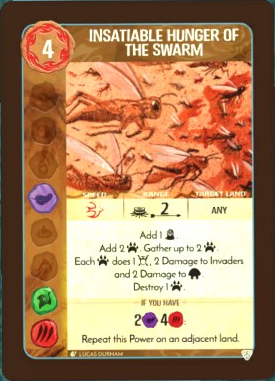 Okay, the range is hot garbage so you're probably going to get Dahan killed much more with this than Devouring Ants. But still! Good for Thunderspeaker, either to use themselves or for someone to use on them. But it's also good for a few other spirits, such as Sharp Fangs Behind the Leaves or Keeper of the Forbidden Wilds, even if they personally don't want to have Dahan in their lands. You can use this on your buddies, y'know! By coincidence, almost every Major power today will be heavily Beast focused and thus good for Sharp Fangs Behind the Leaves. Tigers Hunting is also a dream card for them, specifically, and almost nobody else due to the existing restrictions Fangs has to live with on a daily basis. At least it's cheap for a Major. 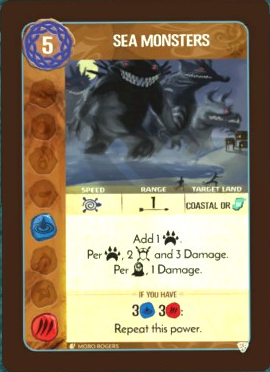 Spirit Island reasons: you can throw a Godzilla at your foes. Kind of a weaker version of Call of the Dahan Ways, except it's a Major power? It's not really a bad power either since it can target multiple lands, but without pre-existing Beast specialization I'd just as soon have Call of the Dahan Ways. 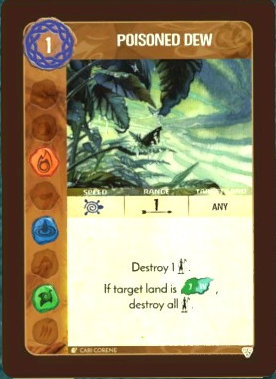 This card is REALLY nice for Ocean's Hungry Grasp, but not because it lets them move their Presence to Inland lands. We already covered why that's a better idea in theory with Indomitable Grasp. No, this one's good for them because it lets any spirit move Cities and Blight. Obviously, moving a City into the Ocean (or just into range of being Drowned) is super amazingly good. Moving Blight is also handy, as mentioned earlier with Absorb Corruption, even if the applications are a little more technical there. Ocean's Hungry Grasp explicitly doesn't let you move presence inland anyway. Indomitable Grasp is the only power that overrides that. And here's the other promo spirit. MOBAs have a concept they call a carry, or at least they do if I remember my secondhand gleaned terminology right. The basic idea is that a carry represents a character who doesn't actually contribute that much to gameplay at first, but who can reach ridiculous heights of power if properly supported up to their zenith. You can already see by the Presence tracks and the innates that Serpent Slumbering Beneath the Island here is very much a spirit in that mold. I wouldn't say that the biggest challenge from playing them comes from being slow, though. Early on, your growth options and high amounts of elements favor a low plays style with high NRG, which we've seen multiple times before to decent effect. The actual challenge comes from maintaining and juggling all the different elements you need to succeed. Also worth noting that while most spirits on the island represent some facet of nature around it? Serpent Slumbering Beneath the Island pretty much IS the island for all human-perceptible purposes. Which makes it pretty thematically appropriate for them to be a carry. 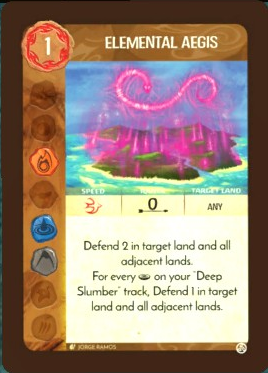 The Deep Slumber track caps how much presence you can have out on the island, and in order to expand that track, you have to make use of this card. It's not a bad card at all, since you regain the NRG you spend on it and then some, plus it has a lot of nice elements for you and whoever you use it on. The issue comes from that you have to absorb the presence of other spirits for it to be of any use. Which isn't a huge issue in practice for most spirits, since you rarely need all of your presence to reliably target your powers. Just something to be cautious of. And hey, if you reliably make use of Serpent Wakes in Power (more on that later) then people will be clamoring to offer you Presence to chow down on. 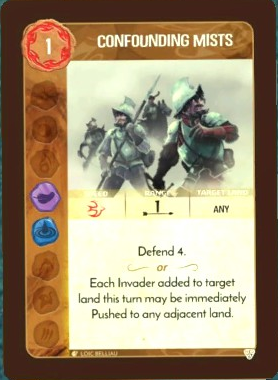 Defend across multiple lands is really nice. Scaling Defend as the game goes on across multiple lands? Are you guys SURE Serpent has a weak kit to start out? Okay, that makes a bit more sense. 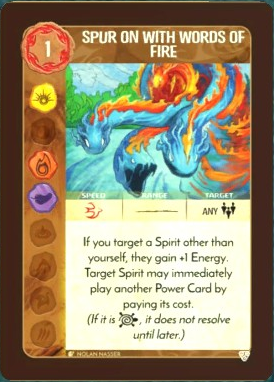 Elemental Aegis is really good, but that's because three of Serpent's four starting cards are just "boost effectiveness for yourself and/or other spirits a bit". You're running hard support early on, although it's not out of the question to get more powers later that can do more tangible things. 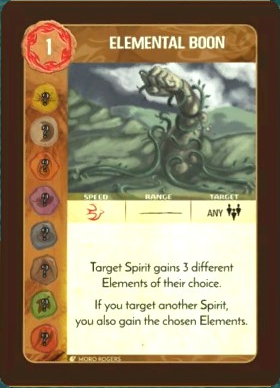 Giving another spirit a bonus card play is pretty nice, so it's weird that you also offer a weak choice of elements. I guess if you want someone to hit a threshold that uses Fire and Water for some reason but they lack the cards in hand to do that, it's nice? Granting a power is nice for sure, but it's curious that this card also lets you play it right out of hand. So when choosing between your two gifts, there's the elements for yourself (and arguably your recipient) to consider, but also whether their existing hand is good enough, or you want to take a chance at improving their capabilities later. Usually, the latter is better. 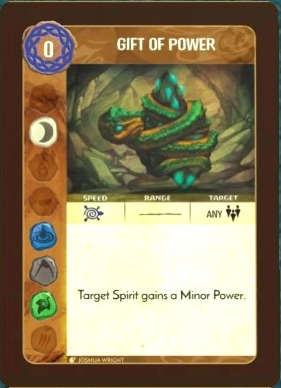 Also, important note: none of Serpent's cards, nor their element track, grant you Plant outright. You have two Any elements, but if you really want to make use of Serpent Wakes in Power, you're really going to have to look for Plant in addition to three other elements. Have fun with that. 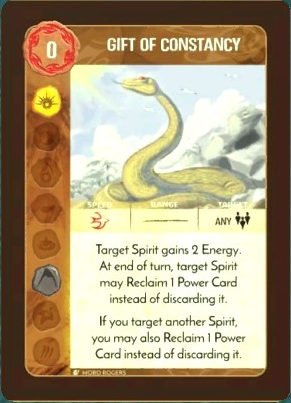 Of all the spirits, Serpent is the one most heavily recontextualized in a solo game. 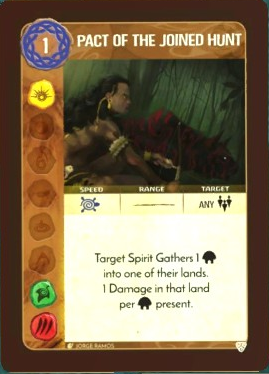 Three of the starting powers target another spirit, but in a solo game, you get to self-target. 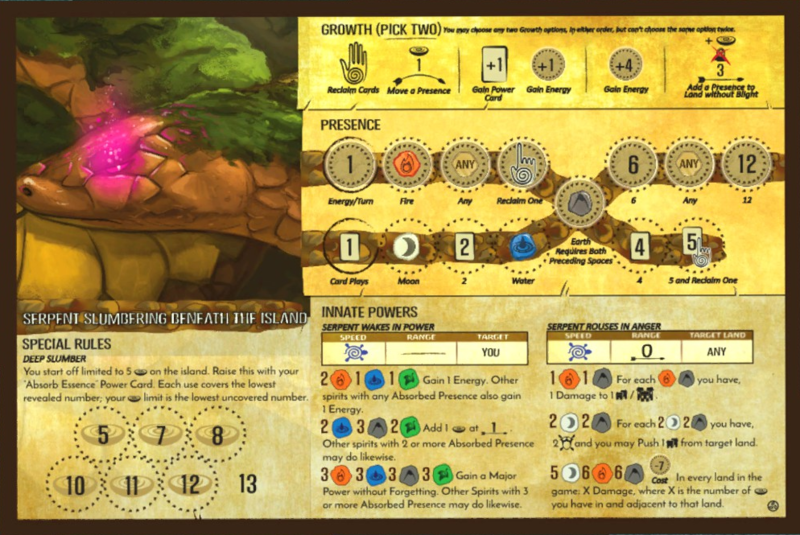 In theory, that's great news for Serpent Wakes in Power, but in practice, I find I'd rather not pony up the Plant for it (to say nothing of the other thresholds). Absorb Essence is slightly painful when you're using it on yourself. 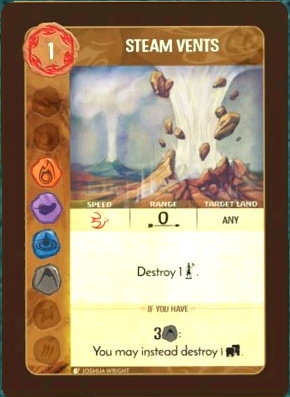 The great news for solo is that Elemental Aegis is nearly a global defend, and you can feasibly play it every round if necessary, especially once "Reclaim One" is revealed. #1 Pro Tip for Serpent: don't ignore the "pick two" in its Growth. Blocking Invader actions is always nice, and Build is usually one of the best ones to block, so I'm totally cool with the Fear here basically being an afterthought, and the Push isn't too bad as a side prize either. The targeting's a bit hairy, but manageable. There's a few cards like these, where the conditional effect for the land and the elemental threshold are 100% independent of each other. Sometimes you might want to make a choice as to whether you stall out exploration or heal the land. Also, goes without saying here, but total dream card for A Spread of Rampant Green. Somehow their dream cards stand out to me the most. I mean, unless the card makes it really blatantly obvious exactly who it's for. Hey did you want another Rain of Blood? At least this one's fast. Slow Explorer destroys are certainly okay, but the range and cost here make this just a little unwelcome, especially considering it only gets really good if you hit the right lands. Plus, the elements are all awkward. Still, it's not terrible. I'd use it. Now this card, here, this one's terrible. 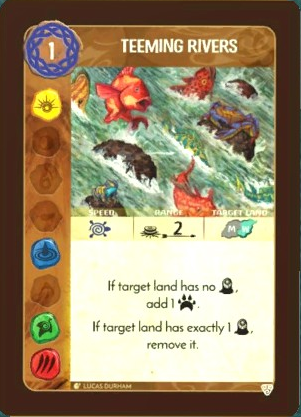 The elements are a complete mess (they're good for Ocean's Hungry Grasp but), the range is hot garbage, and it either has a terrain dependency or an area attack depending on whether you have other ways to get disease out fast enough to capitalize on it, AND other damage so you can actually use the area attack. And it costs 1 NRG. How about no? Flavorwise, it makes sense for the threshold here to have a completely different effect. Without the threshold, you're limited to forcing one land to fight itself, but if you have it, suddenly you can direct an entire Ravage to your own benefit. Mechanically, it's a bit awkward to me, not least because this is one of the few powers that capitalizes on pre-existing Strife, and it just drops that for the threshold. But hey, it's a dream card for Thunderspeaker that doesn't require a single Dahan, so that's cool. Tigers Hunting but also it's incredibly dangerous and unsafe. The damage, Fear, and range are better, but every other part of this card is significantly worse. It's still good overall, just be careful with it, especially because chaining the effect to another land also means killing Dahan and adding Blight in another land. If you discount Instruments of Their Own Ruin, this is the only real Strife-focused Major power in the game so far. It's not too bad really, although without the threshold on it, stacking further Strife to capitalize on is going to be difficult. Needless to say, this one's great for Shadows Flicker Like Flame. 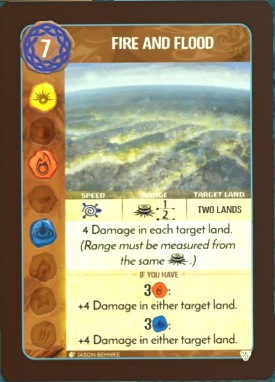 The most interesting thing about this card is that it explicitly targets two lands, rather than just having effects spill over into other lands nearby. And also that it has two separate thresholds, one for each primary element in the power, which means almost any spirit could easily hit one, but might not get both. Thematically? Ugh. This is an excellent but boring card, and I'll happily take a more flavorful but actively worse option any day of the week. Out of spirits to discuss, so this post will be about the various adversaries in the game. Adversaries represent the major colonial powers of the era, although it's worth noting that this is a slightly alternate reality they're working with here. They all have different motivations and pressures for what they're doing, but they're all still colonial asshats and you should destroy. Them. ALL. 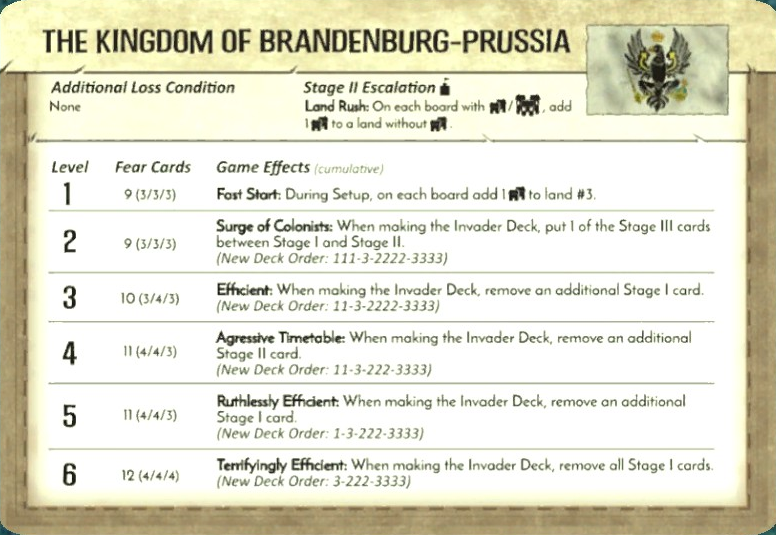 Brandenburg-Prussia is the most conventional "difficulty slider" of the lot, as they ask of very few changes to how the game runs throughout play, instead just modifying setup for a speedier deployment of the Invaders. Spirits that have a slower time getting off the ground, like Serpent Slumbering Beneath the Island, will have a harder time here, but that's about the only real caveat. 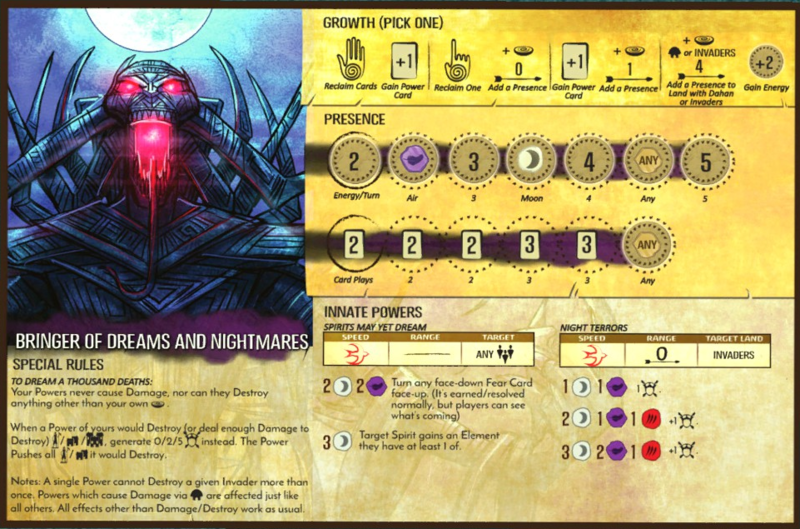 Note also that the Fear deck adds extra cards as you increase the difficulty of your adversary. This is primarily a balancing feature to handle spirits who can shortcut the usual win condition by gunning for a Terror victory. You can still play spirits that deal in Fear, just don't expect to be completely orthogonal to the increased difficulty. While Brandenburg-Prussia is the easiest adversary to incorporate into normal gameplay, I'd argue that Sweden is the easiest to fight against. They look really scary with their Ravages, but those only matter if they actually get to pull those Ravages off. It only takes two or three ravages to lose to Sweden in a lot of cases, so all you have to do is put everything into ensuring those Ravages don't happen. Which, y'know, you're already doing normally against most adversaries. The only real gotcha is the Stage II Escalation. 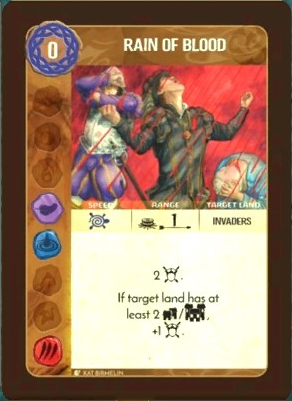 The first time that little fort icon comes up in the Invader deck, you resolve the effect on that text, which usually means Stage II Invader deck threatens to destabilize your tempo even after the spirits have gotten ready for handling the Invaders. Most Stage II Escalations aren't too bad if you prepare properly, but Sweden's is particularly nasty. For my money, England is the hardest of the three in the base game. 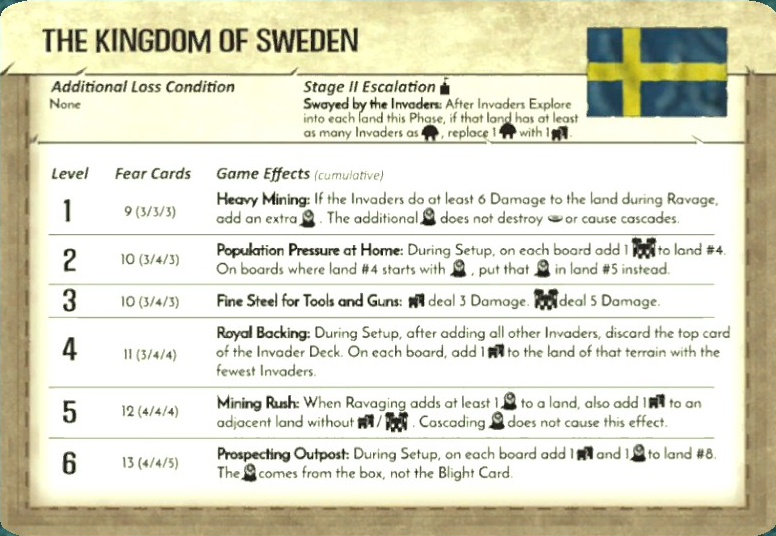 Like Sweden, they specialize in one specific Invader action, that being Build. Unlike Sweden, it's much harder to stop that particular action, especially with England's multiple ways of getting extra Builds out. 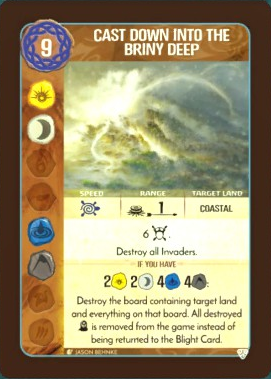 They have an alternate victory condition too, but that's not even close to necessary for them to win when every single land gets some REALLY deadly Ravages with all those extra Towns and Cities popping up. Like the manual says, this adversary becomes much harder for spirits that rely on killing Explorers to prevent Builds, and much easier for spirits with good structure-killing potential, like Lightning's Swift Strike. It's not even easy for them alone, though, because it still takes some time and planning to ramp up to the City-destroying powers. Definitely consider some of those more destructive powers like Drought, even where you normally would find them overkill. 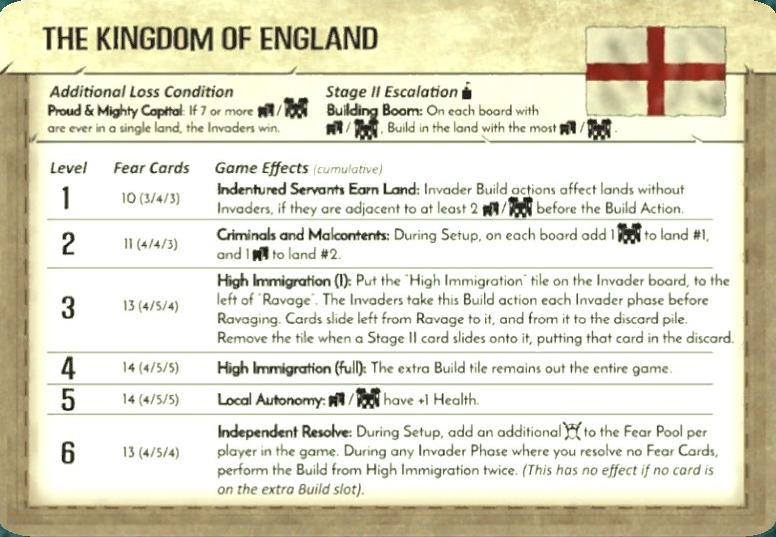 Branch and Claw only adds the one adversary, which is a little disappointing because of how much the expansion adds for the adversary they DID include, as well as for how that adversary handles very much like England. 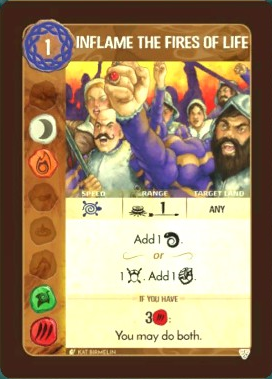 It's a little interesting how France ends up being the adversary that uses slave labor, right down to having a card in the Event deck for it (which keeps coming up until it hits the Rebellion at Invader Stage III). That's the main difference between them and England, which provides the only real strat alteration. In particular, Strife becomes much better, since it lets Dahan work to free their enslaved comrades. 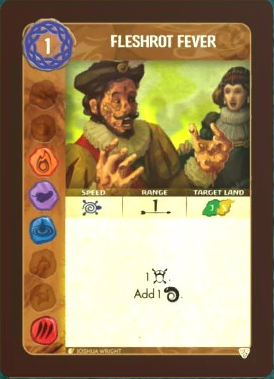 On the other hand, Ravages under France become even hairier since the Blight is very slow to heal, and there will just be Explorers literally everywhere to add chip damage. Hey look it's one of the rare few times where Raging Storm is actually worth the trouble. Sorry, got busy with important life problems. Let's get these last cards wrapped up. Those are literally the exact elements Bringer of Dreams and Nightmares wants, and it's not even that bad for the price. Basically just "do the thing you already do, but also get a bonus point if Beasts". Encompassing Ward, but for one Sacred Site only. 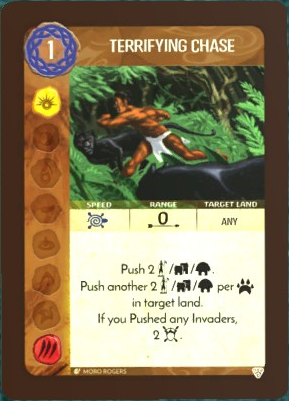 It's not a very good card most of the time, unless of course your team either has lots of Sacred Sites (but not Vital Strength of the Earth) or lots of Beast-dependent abilities. If you have both, it's great. The elements are also pretty wacky and very much Not For Everyone. I still like it solely because helpful snakes. This might be the single funniest card in the entire game. I have taken it on that basis alone and I don't regret it a single time. Infested Aquifers is bad because of the wide range of restrictions it has to contend with, but Fleshrot Fever doesn't have nearly as many restrictions (and some generally better elements for a lot of spirits, including Lightning's Swift Strike). As such, it's mostly the better card. The interesting part is that it targets the two lands that Infested Aquifers doesn't. I guess that makes for a kind of balance between the two cards despite their similar portfolios, but significantly different mechanics. 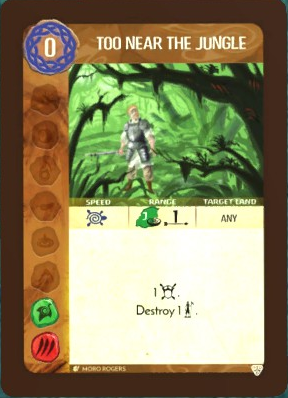 One of the better Strife-adding cards in the game, really only hampered by the Sacred Site targeting restriction. Going Fast really helps it pack some kick, and the Fear is nice too. I guess the Strife is from everyone going "okay who fired the mortars without clearance?" but it's hard to tell for sure. In exchange for being generally weaker than either card before it, you have the potential, if running Animal, to get both effects for one card play. As such, this is a dream card for Sharp Fangs Behind the Leaves (and having every element they could ask for doesn't hurt either). 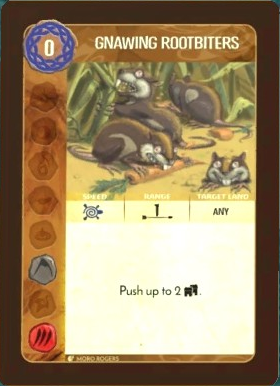 A lot of Branch and Claw is about incentivizing Animal as an element, considering how it was the weakest element in the base game by a significant margin. I think they did a pretty good job of it too. One rule that sometimes trips up new players is that you can't use any NRG you gain on the Fast power resolution to pay for cards you've played. NRG has to be up front. 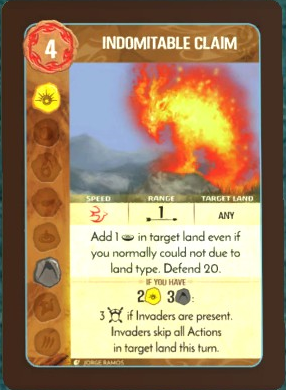 There are a lot of cards that do this in the base game, but Spur On With Words of Fire is the only card that grants another card play. 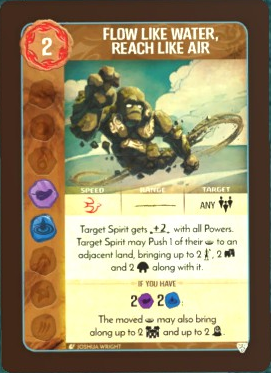 I'll give you a hint: unless you really have some good elemental synergy with another spirit, you can usually read this as "Elemental Boon, but Better". 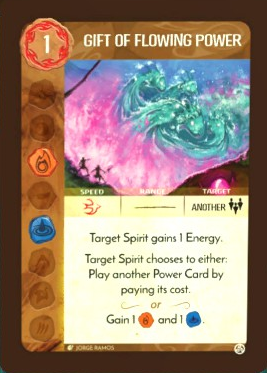 Giving a spirit freely customizable elements is nice for sure, but usually the cards in their hand give them what they want anyway, unless their draws have sucked or they're running on empty anyway. After I watched Jumanji as a kid, I literally couldn't go into flower shops with my mom without being paralyzed with fear. 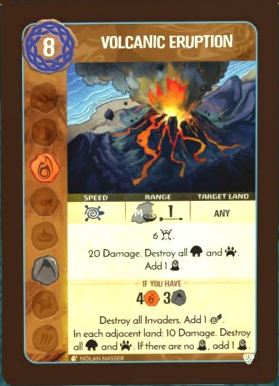 Anyway this is a pretty nice attack power, very good range, somewhat restrictive on lands. I don't know why it has Sands on the roster, but hey. You REALLY want that threshold on this one because multi-targeting, but pushing for Air and Plant together is a bit difficult. 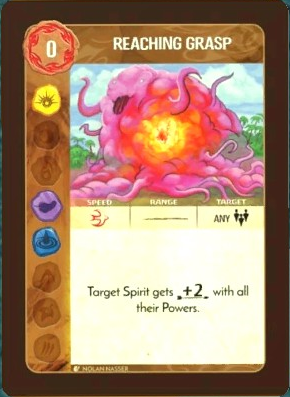 This is the most expensive card in the game, and most spirits can't even get close to that threshold. Your best bet for that is Ocean's Hungry Grasp, and even then Sun isn't usually their wheelhouse. Without the threshold, it's still a single-land nuke, albeit a Coastal one asking for a Sacred Site. Good, but maybe not 9 NRG good. I have gotten the threshold effect once in a game. Usually, that's all you need to win a game. 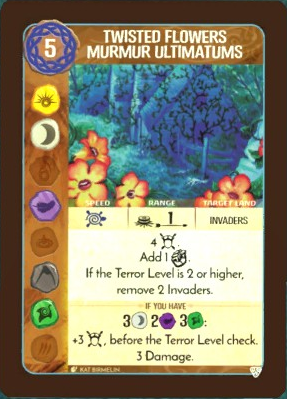 Sure, it has a ton of collateral damage, but between the huge jump in Fear you'll get for this (frequently enough to earn 1 or 2 cards outright) and the sharp limiting of what lands the Invaders can target, if you've activated this card's threshold, you're in for a much easier game down the line. 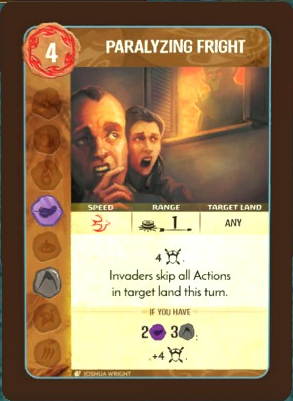 This is a good card with a pretty powerful effect, but also this might just be one of the illustrations that actually makes me feel a little bit bad for the Invaders. Colonial jackasses or not, that looks downright heinous to suffer through. It doesn't even deal damage without the threshold and it still looks painful. Y'know what would make the carnivorous plant from Jumanji scarier? IF IT WAS ALSO ON FIRE. Nobody, Robin Williams included, wants to approach that with a sabre. 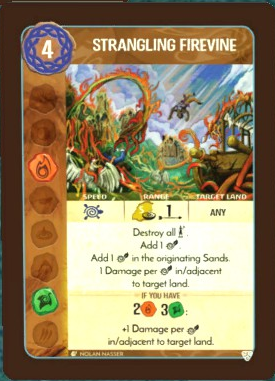 Also this card is insanely good, but the requirement to target it from a Sands makes it a little tricky to work with. 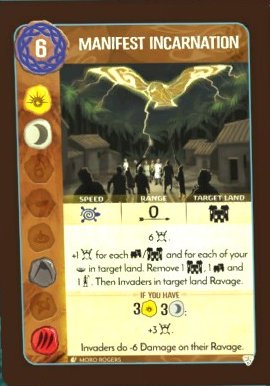 Note that you can target the same land the power originates from if you really want to spike the damage. And finally, the power that uses every token. The easy threshold, versatility, low cost, and elements ensure that basically anybody who gets this in their major power draw has something to work with here. Nobody doesn't like Pent-Up Calamity.